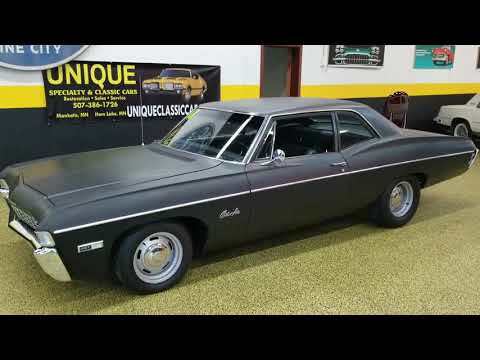 1968 Chevrolet Bel Air 2dr, 454, auto, drives nice! TRADES? One of the most amazing things about this car is how it drives out! This is a 1968 Chevrolet Bel Air. This car is a blast to drive, some guys call them pounders or trippers cause they use them to travel and put some miles on going to shows. That's what this car is, get in it and go, have some fun driving it. It's powered by a deep throaty big block 454 so it's not lacking any power. The body on this car is unbelievably SOLID! The exterior is finished in flat black for that "sleeper" look and that goes good on this car. The interior has been refinished in a cloth/vinyl seating combination. You can see in the pictures that there are a couple tears in the front seat and the previous owner has a blanket covering it which ads to the looks of this Chevy. It's nicely equipped with power steering, power brakes (discs up front) automatic transmission and a retro looking modern radio. Please feel free to call us with any questions at 507-386-1726 and ask for Jay, Jeff, or Landon. This car will not disappoint and we always welcome 3rd party inspectors. You can also email us at "sales@uniquemankato.com" ALL TRADES AND OFFERS WILL BE CONSIDERED...FINANCING IS AVAILABLE.